*• Tarell Basham, outside linebacker: *Basham, the team’s third-round pick out of Ohio University, has played in 10 games so far, and has collected three tackles (one for a loss) and two quarterback hits on the year, as well as his first-career sack, which came Week 8 against the Cincinnati Bengals, when he brought down quarterback Andy Dalton for a 14-yard loss. Basham played nine snaps on defense and 12 special teams snaps in last Sunday’s Week 12 matchup against the Tennessee Titans. *• Darrell Daniels, tight end: *Daniels, who went undrafted out of Washington, missed his first game of the season last Sunday against the Titans as he’s been dealing with a hamstring injury. In 10 games, Daniels — who had his first-career start Week 4 against the Seattle Seahawks — has caught three passes for 26 yards, including a career-best 13-yard reception in the Colts’ Week 5 victory over the San Francisco 49ers. Daniels has also contributed two tackles on special teams. *• Jermaine Grace, inside linebacker: *Grace, who was just claimed off waivers by Indianapolis from the Atlanta Falcons on Nov. 15, played in his first game with the Colts last Sunday against the Titans, as he logged 12 snaps, all on special teams, and had one special teams tackle. Grace, who went undrafted out of the University of Miami, played in five games with the Falcons earlier this season, primarily on special teams, but did not record a tackle. • Nate Hairston, cornerback: **Hairston has thrived in his role as the Colts’ primary nickel cornerback, playing in 10 of the team’s 11 games so far, and earning his first-career start Week 2 against the Arizona Cardinals. Hairston, the Colts’ fifth-round pick out of Temple, logged his first-career interception last Sunday against the Tennessee Titans, and also added five tackles and two passes defensed. On the season, Hairston has 28 tackles (two for a loss) with two sacks — which is tied for the most among all NFL cornerbacks — three quarterback hits, one interception and five passes defensed. *• Kyle Kalis, guard: *Kalis, who went undrafted out of Michigan, was signed by the Colts off the Washington Redskins’ practice squad on Oct. 2. Since that time, he has played in four games in Indianapolis and had two straight starts in Weeks 9 and 10 at right guard, though he was inactive for last Sunday’s game against the Titans as he’s been dealing with a knee injury. In all, Kalis has played 149 offensive snaps so far, as well as 17 snaps with the special teams units. *• Marlon Mack, running back: *Mack, the Colts’ fourth-round pick out of South Florida, has emerged as the Colts’ second running back this season behind starter Frank Gore, and has shown several flashes of brilliance throughout the season. In nine games, he has ran the ball 63 times for 230 yards (3.7 yards-per-carry average) with two touchdowns, and he has also caught 14 passes for 149 yards and another score. Included in his carries are runs of 35, 24 and 22 yards, respectively, and he also has a 34-yard reception, as well as a 24-yard touchdown catch on a screen play against the Bengals. *• Kenny Moore II, cornerback: *Moore, who went undrafted out of Valdosta State, has been a special teams standout for the Colts this season, as his 250 special teams snaps — more than 75 percent of the Colts’ special teams snaps in all — leads all Indianapolis players. Last Sunday, after a hand injury to top cornerback Rashaan Melvin, Moore II got the most action with the defense he’s had all season; in 32 defensive snaps, he finished with three tackles and also had a special teams stop. In 11 games, Moore II leads the Colts with eight special teams tackles, while he has four tackles for the defense. *• Rigoberto Sanchez, punter: *Sanchez has been very solid in his first season as the Colts’ punter and kickoff specialist. Sanchez, who went undrafted out of Hawaii, has punted 62 times for 2,835 yards — an average of 45.7 yards per punt — and has a net punting average of 43.4 yards per punt, ranking fifth in the NFL, while he also has 21 punts inside the 20-yard line. The Colts this season also allow just 18.3 yards per kickoff return, which ranks second in the league, while Sanchez’s punts are returned for an average of just 5.2 yards per kick, which is tied for the sixth in the NFL. *• Grover Stewart, defensive tackle: *Stewart, the Colts’ other fourth-round selection out of Albany State, has been a key to the depth of the team’s defensive line rotation this season. In 10 games, Stewart has collected 11 tackles (one for a loss), and he has played in 129 defensive snaps and 54 special teams snaps as he develops behind a veteran defensive front. Stewart had two tackles last Sunday in the Colts’ loss to the Titans. *• Anthony Walker, inside linebacker: *Walker, the Colts’ other fifth-round selection out of Northwestern, has seen action in four games this season as he’s worked his way through a nagging hamstring injury. A special teams-only contributor to this point of his rookie season, Walker — who played consecutive games in Week 9 and 10 for the first time all year — has three special teams tackles so far.  He logged 18 special teams snaps last Sunday against the Titans and downed a first quarter punt. Rookies on Injured Reserve:• Deyshawn Bond, center:** Bond, who went undrafted out of Cincinnati, started the first four games of the season at center for the Colts in place of the injured Ryan Kelly, and became just the fifth undrafted NFL rookie since 2001 to start at center in his team’s season opener. Bond was placed on IR on Oct. 3 after suffering a quad injury.